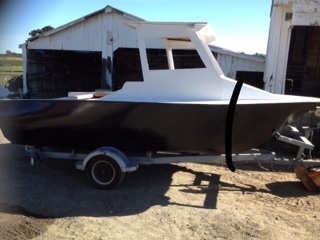 I am building the Glen-L Riviera boat. 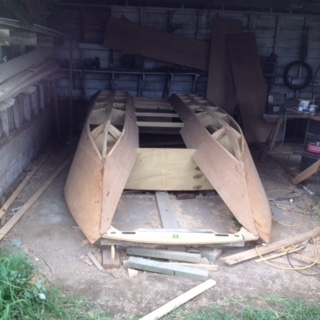 http://boatbuilders.glen-l.com/41211/glen-l-riviera-build-donald-collier-cookeville-tn/. 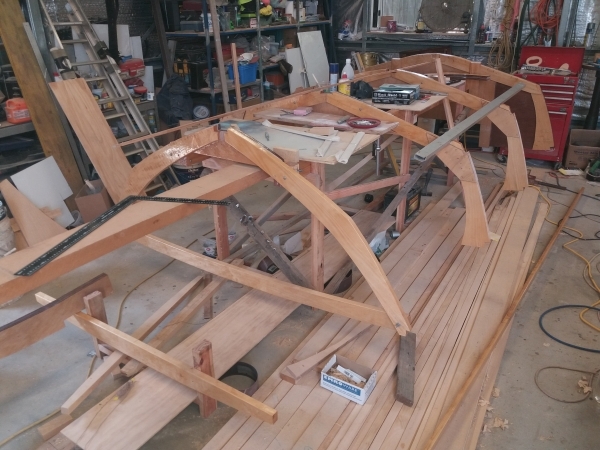 I am at the point of applying the final veneer. 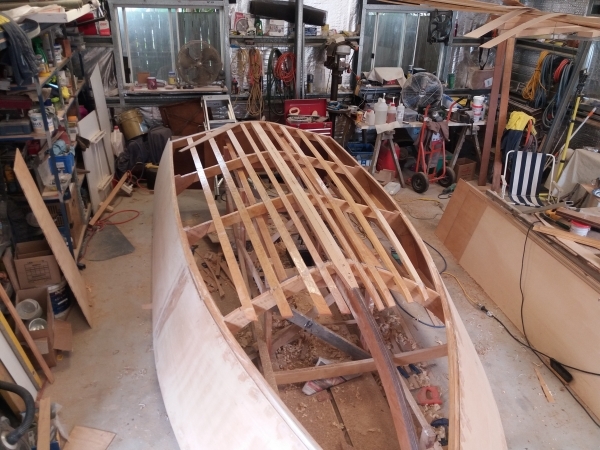 After looking at other boat build blogs, websites, and pictures, I was not sure how best to temporarily fasten the veneer while the epoxy dries. 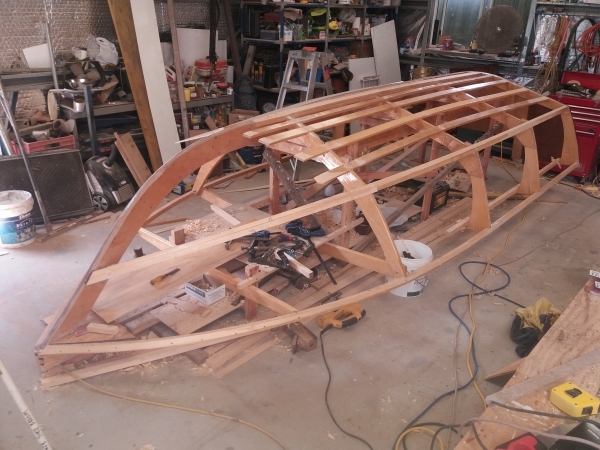 There is a lot of information logged by boat builders using various methods of fastening. They range from vacuum pressure, metal stapling, nailing, and using plastic staples. Nailing and vacuum didn’t seem like good options for me, especially since I don’t have a vacuum pump. It seemed like most builders used staples. The most common complaint was the difficulty in removing the metal staples. The idea of a plastic staple that you just sand off seemed like a great option. 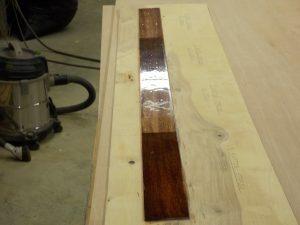 I could not find any close up pictures of the finished veneer using the plastic staples. Veneer with T50 staples removed and the veneer finished with epoxy. 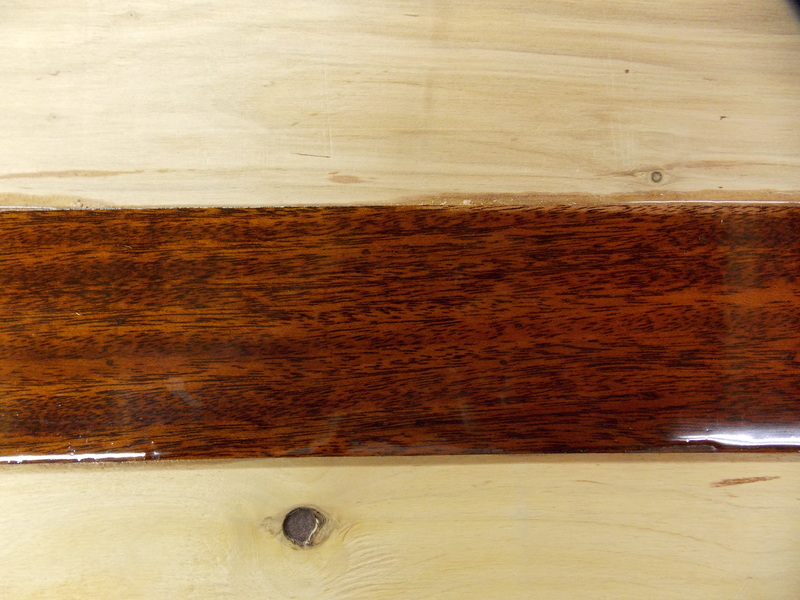 Veneer with T50 staples removed and the wood stained and then finished with epoxy. 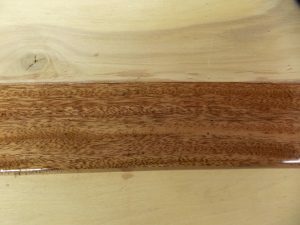 Veneer with Raptor staples sanded off and veneer finished with epoxy. 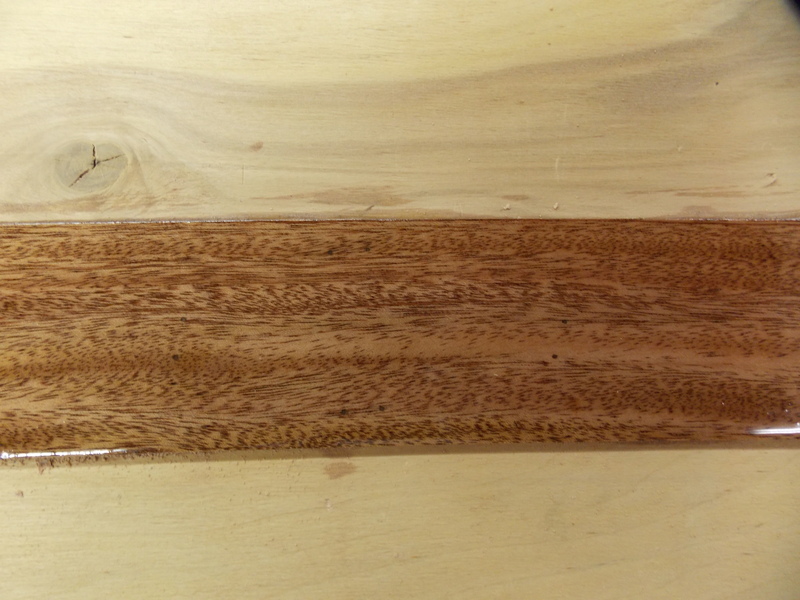 Veneer with Raptor staples sanded off and the wood stained and then finished with epoxy. 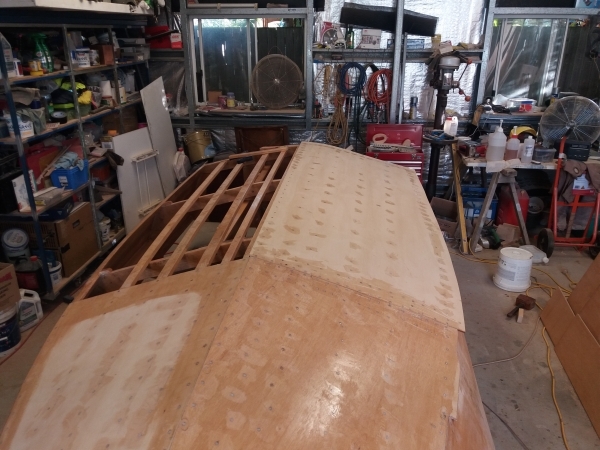 The first set of picture shows each section with staples applied but not stained yet. 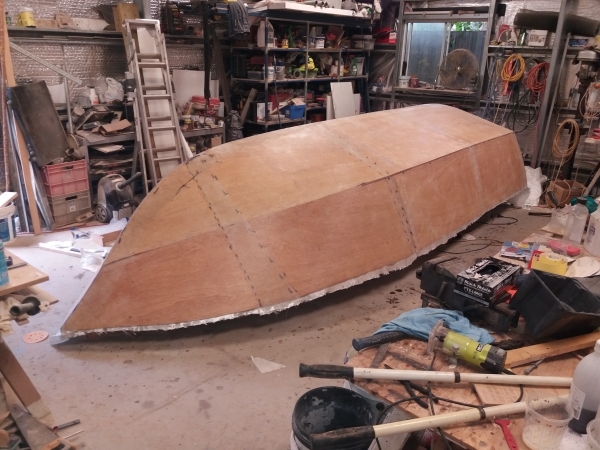 The veneer was epoxied to a piece of scrap plywood to simulate fastening to a boat. Each picture was taken with a 6 Mpx camera. 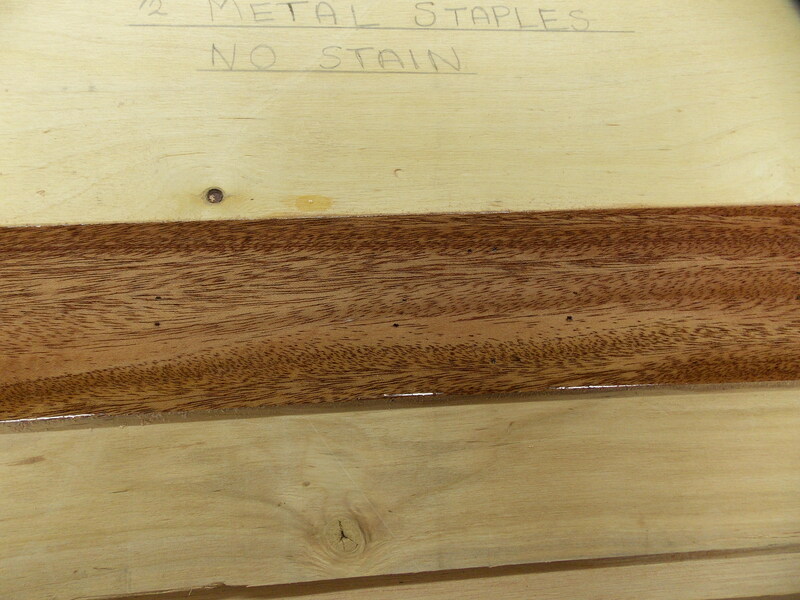 Click on each picture to get a larger view showing the detail of the staples and wood condition in each section. In the next group of pictures. 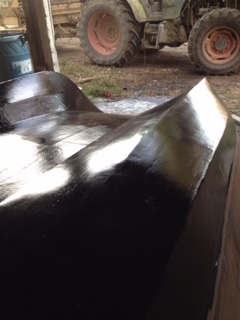 The T50 staples were pulled out and the Raptor sections were sanded with a belt sander using an 80 grit belt. 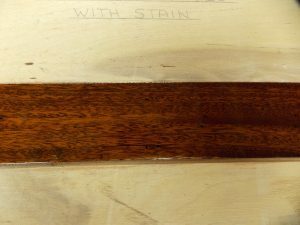 To have an equal comparison of the wood after the staples were removed, all four sections of the wood were sanded with the belt sander. 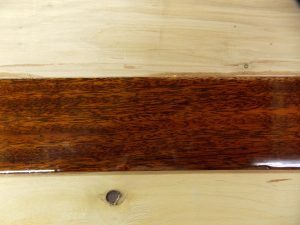 A brown mahogany water based stain was used on the stained sections. After the stain dried, two coats of epoxy were applied with a day to dry between each coat. 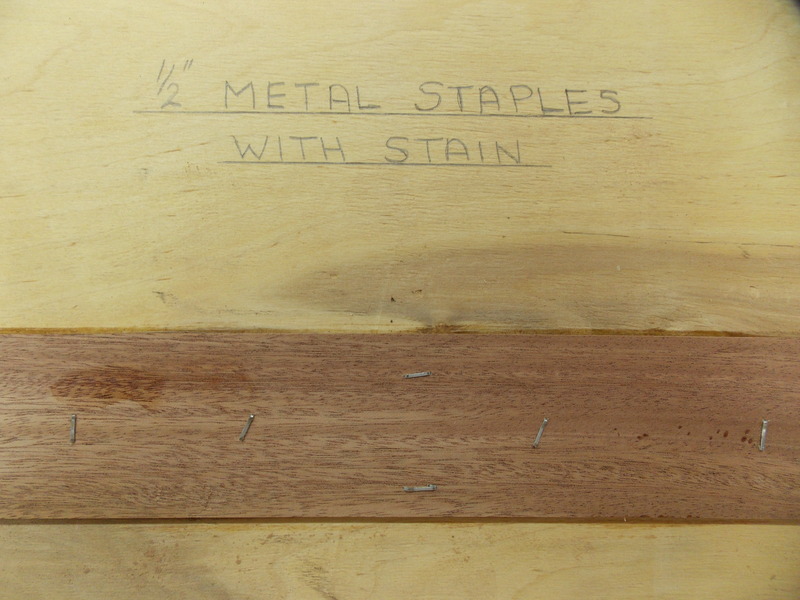 Section 1 – T50 Staples without stain – NOTE – You can see where the staples were removed. It is not obvious, but the marks are visible if you know where to look for them. Section 2 – T50 Staples with stain – Note: The staple holes are somewhat visible but less than the section with no stain. 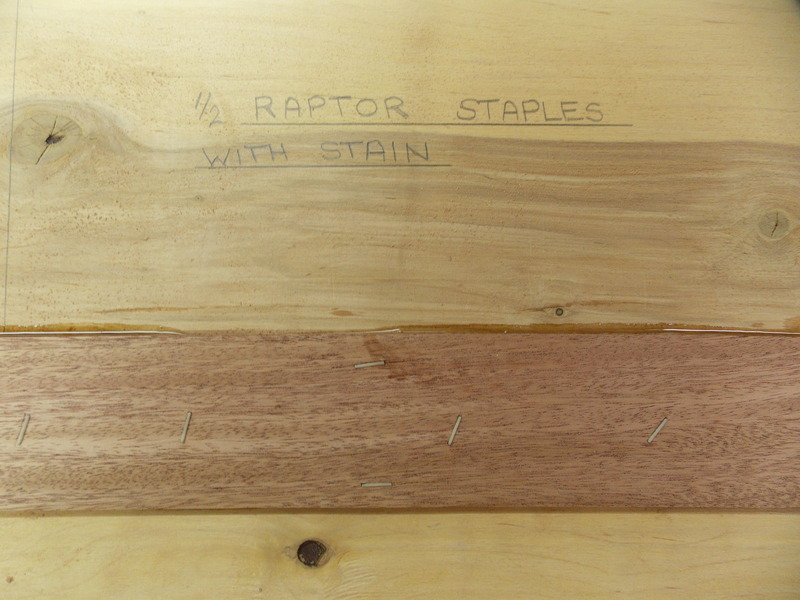 Section 3 – Raptor staples without stain – Note: The staples are visible if you know where to look. They are slightly less visible than Section 1. 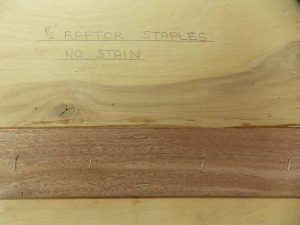 Section 4 – Raptor Staples with stain – NOTE: They absorb stain and become invisible. T50 Staples – Easy to use and good holding power. They are difficult to remove. To remove the staples, I ground an old flat screw driver to a sharp edge so I could get under the staple and partially lift it. This almost always left a mark from the screw driver. Pliers were then used to pull the staples out. Once the staples are pulled out, there are holes left in the wood from the staples. 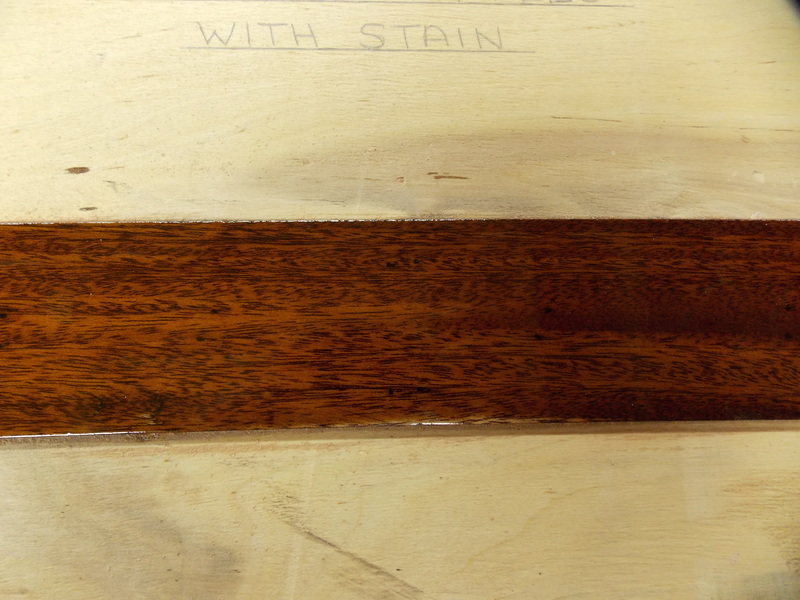 When either finishing with or without stain, the holes are still somewhat visible. 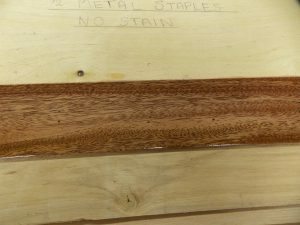 Even using a water based stain, the holes do not close significantly. Raptor Staples – Also easy to use and good holding power. They sand easily with a belt sander. 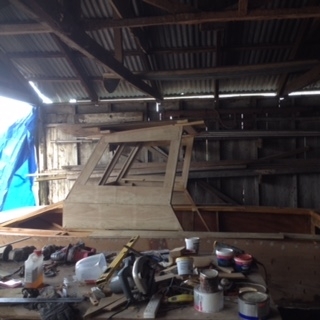 The bar of the staple is sanded off, but the legs are still in the wood. The staples only come in an off white color so they are slightly visible if no stain is applied. After the stain was applied, the staples are very hard to find. 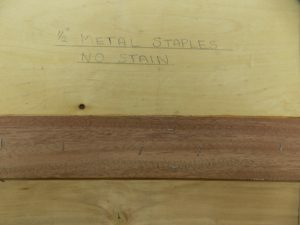 The staples do absorb stain and then blend in with the wood. They are the least visible of any of the other comparison sections. 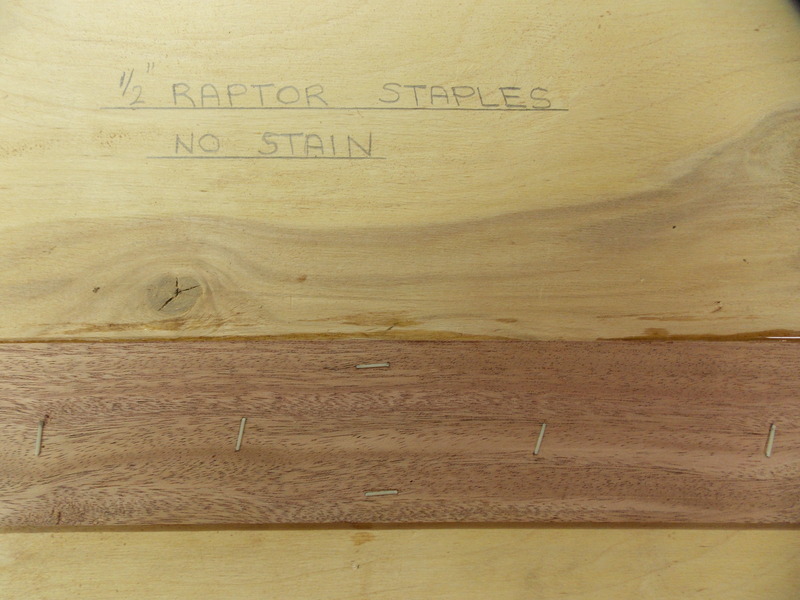 Based on this comparison, I am going to use the Raptor staples to apply the final veneer. I purchased the staples and the recommended pneumatic staple gun from Glen-L. 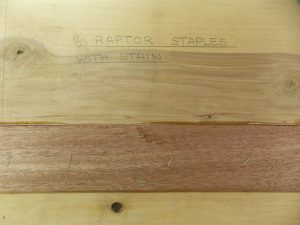 The Raptor staples are 1/2″ wide so they will not work in most staple guns. I tested the staples in various pieces of scrap veneer and found they work very well. I would definitely recommend the Raptor staple system.